Dan Devine’s saggar-fire technique put to work with beautiful results. This vessel features a soothing combination of creamy oranges and purples splashed with smokey grey. A belt of texture and a grey rim give this piece structure and sophistication. Felt pads on the bottom prevent damage to display surfaces. Made in Minnesota by talented member artist and art educator Dan Devine. Dan works in many mediums, but specializes in ceramics using low-fire and primitive firing techniques, including raku, pit-fire, horse-hair raku, and saggar-fire. 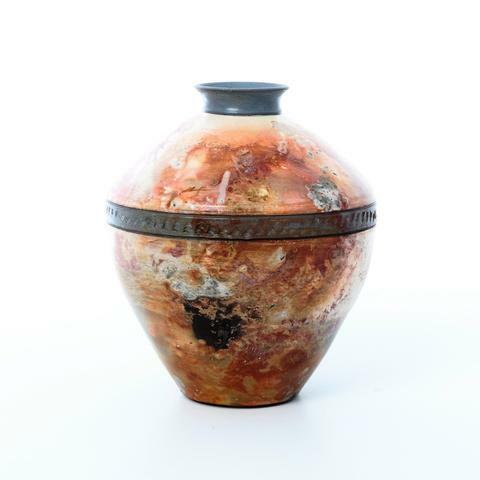 This gorgeous vessel is an example of his work using the saggar-fire technique, a centuries-old Chinese firing technique which, through unique finishing processes and artistic skill, produces individual works of art that are truly one of a kind. Piece measures approximately 7.5″ high, 6.5″ in diameter, and could serve as a functional vase or a stand-alone display piece.